$3 million, $5 million — whatever your definition of a luxury home may be, sales in the Seattle metro area are up. 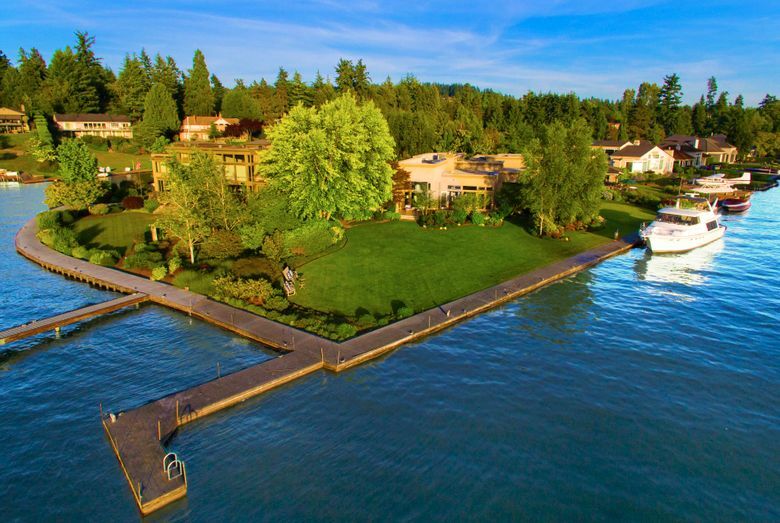 An eight-bedroom mansion on Mercer Island’s Faben Point fetched last year’s highest price for a home in King County — $13.8 million. The buyer, whose identity was concealed through a shell company, paid cash, public records show. Brokers say the buyer is from China and will use it as a family home. The next highest was the $11.2?million sale of a four-bedroom house on the Hunts Point waterfront, bought by Scott Guthrie, a senior Microsoft executive who oversees its Cloud and Enterprise group. “Obviously the sun is shining on us,” said Wendy Lister, the Coldwell Banker Bain managing broker in Bellevue who listed both homes. Those sales sum up two broad trends seen last year in the Seattle area’s ultra-high-end home market: Buyers tend to be either technology-firm leaders, including those moving up from Silicon Valley, or foreign nationals. Opinions vary on what counts as a “luxury” home, but sales were strong across the board last year. King County saw 33 homes sell for $5 million or more, more than double the number in 2010, according to Windermere Real Estate. Most buyers were business owners or corporate executives — and about 40 percent were foreign nationals, primarily from China. Nearly two-thirds of the 33 homes were cash sales, according to Windermere, which was involved in 25 of the transactions. Cash purchases of luxury real estate by shell companies will get closer scrutiny this year because federal law-enforcement agencies say they’re concerned that criminals and corrupt foreign officials may be laundering dirty money through the nation’s luxury real-estate market. Homes selling for $1 million and up are more common in King County: They made up 9 percent of all homes sold in 2015, up from 5 percent in 2010. 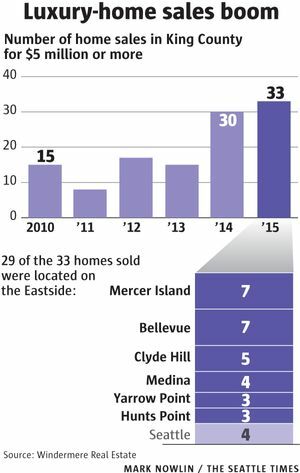 On the Eastside, 1,484 single-family homes sold for at least $1 million last year, nearly triple the number in 2010, the Northwest Multiple Listing Service reported recently. That dwarfed Seattle, where 745 single-family homes sold for at least $1?million. Seattle, however, held the bragging rights for high-priced condos: Sixteen in downtown Seattle sold last year for $2 million or more. The Escala, which gained global exposure as the setting for fictional tech billionaire Christian Grey’s sadomasochistic dungeon in the popular book and film “50 Shades of Grey,” led with a $3.1 million sale. Some brokers consider $3?million the new threshold for luxury homes, and the West Bellevue corridor rules the roost in that market: 84 homes in West Bellevue, Mercer Island and Kirkland’s Bridle Trails sold last year for $3 million or more, up from 73 in 2014, according to Realogics Sotheby’s International Realty. At that level, Hunts Point had the highest median price — $7.88 million — with five homes that fetched at least $3 million in 2015. But Clyde Hill had the biggest jump in home sales: Twelve homes sold for a median price of $4.47 million, up from six the previous year. New construction is fueling many of those eye-popping prices as builders tear down old homes to make way for luxury homes. Last year, the highest price paid for a newly constructed home was $6.21 million, according to the MLS. Buyers “really don’t want to have to buy homes that need a lot of renovation,” said Windermere broker Moya Skillman, co-owner of Team Foster in Bellevue. The all-time sales record in the Seattle area remains a Mercer Island mansion sold in 2012 for $21.625 million. Unlike the lower end of the market, where homes commonly sell above list price, luxury homes tend to sell slightly below list price. Brokers say that’s partly because the pool of buyers is smaller. For instance, the 13,721-square-foot Mercer Island waterfront mansion that fetched last year’s highest price in King County was built in 2007 and first put on the market in 2010 for $23.8?million. The list price was eventually lowered to $16.5 million — and the foreign buyer closed for $13.8 million. “They’re part of this newer trend of buyers coming over from China that want to move to Seattle, bring their families here and become part of the community,” said Skillman, who is familiar with the deal but wasn’t involved. Buyers from China for the first time last year edged out those from Canada as the largest group of foreign buyers of homes in the United States, according to the National Association of Realtors. With so much demand, Realogics Sotheby’s is sponsoring a new luxury Seattle magazine in Chinese that could accelerate the influx of international buyers. They’re already influencing the makeup of neighborhoods. Consider Newport Shores, in the top-ranked Bellevue School District, which from 2011 to 2013 had no homes sell for $3?million or more, Jones said. But in 2014, there were three such sales, and last year there were eight. All but two of the 11 sales in the past two years appear to be to Chinese buyers, Jones said. Brokers say it’s no big deal that the identity of the foreign buyer of the Mercer Island mansion was cloaked by acquiring the home through a legal entity called a limited-liability partnership, or LLC. Domestic buyers do it all the time. Still, a chill is in the air for cash buyers of luxury properties, particularly foreigners. Starting on March 1, in Manhattan and Miami-Dade County, Fla., certain title-insurance companies are required to identify the persons behind shell companies used to make all-cash purchases of property, under a recent Treasury Department order aimed at detecting money-laundering by foreigners in real estate. Firms must report buyers in Manhattan cash sales of over $3 million and those in Miami exceeding $1 million. It’s the first time the federal government has required real-estate firms to disclose the identities of clients behind transactions, inspired in part by a New York Times series last year on the growing role of shell companies in real estate. “Whatever happens there is going to play out across the country,” said Joseph Ho, a Berkshire Hathaway HomeServices broker on the Eastside who works with many buyers from China.